Welcome to Today@WKU, the daily newsletter from WKU Public Affairs, for February 27, 2019. 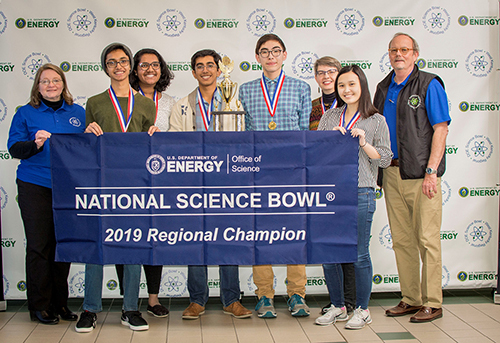 The Gatton Academy Advances to 2019 National Science Bowl: A team from The Gatton Academy won the U.S. Department of Energy's (DOE) West Kentucky Regional Science Bowl on Feb. 16. The DOE National Science Bowl® challenges students’ knowledge in all areas of science, including biology, chemistry, Earth science, physics, energy, and math. Author of 'The Woman's Hour: The Great Fight to Win the Vote' to visit WKU April 29-30: Elaine Weiss, author of The Woman’s Hour: The Great Fight to Win the Vote, will visit WKU April 29-30 to kick off a yearlong celebration of the 100th anniversary of the 19th Amendment. Weiss will spend time with students in the classroom during her two-day visit and will present the Boyd-Lubker Visiting Scholar Lecture at 7 p.m. April 30 at the Downing Student Union Auditorium. WKU's Model Arab League team competes in regional conference: For the fourth year in a row, WKU’s Model Arab League team competed in the Ohio Valley Regional conference Feb 14-16 at Shawnee State University in Portsmouth, Ohio. What’s Happening at WKU: Check out a list of events through March 16. Kentucky Journalism Hall of Fame inductees: Former WKU School of Journalism & Broadcasting faculty member Corban Goble and WKU graduate Tom Caudill will be among seven new members inducted into the Kentucky Journalism Hall of Fame on March 25 in Lexington. Board of Regents to conduct quarterly meeting Friday: The WKU Board of Regents will conduct its quarterly meeting on Friday (March 1), beginning at 8:30 a.m. CT in the Martin Regents Room of Jody Richards Hall. Parking advisory: PS1 & PS2 Used for Fourth Region Basketball Parking: WKU is hosting the 2019 KHSAA Regional Basketball Tournaments in Diddle Arena through March 5. Men’s golf: Sargent's Ace, Bevington's Surge Boost Tops in Auburn Final Round: WKU golfers Billy Tom Sargent and Tom Bevington made a late surge Tuesday in the final round of Auburn's Tiger Invitational – coming inches away from back-to-back hole-in-one's – to help each tie for 12th individually in a field loaded with top competitors. Next: The Hilltoppers are back in competition next week at East Carolina's ECU Intercollegiate on March 4-5 in Greenville, N.C. Baseball: WKU Focused on Midweek Challenge vs. Murray State: WKU Baseball hosts its first of four home midweek games of the 2019 season today as the Hilltoppers will face Murray State for a 3 p.m. first pitch at Nick Denes Field. Migrants at Tijuana Border Are the Focal Point for WKU Photojournalism Student: All the attention focused on migrants at America’s border with Mexico convinced a WKU photojournalism student to pack up his camera and head to Tijuana. Exhibits at Kentucky Museum: A Culture Carried: Bosnians in Bowling Green (through May 11); Highbrow; Even Coverlets Get the Blues; Jacqui Lubbers: A Legacy in Weaving; US Bank Celebration of the Arts (March 2-April 5); Arte Cubano (March 9-May 28); plus other gallery and on-campus exhibits. (Museum hours/visitor information) Contact Kentucky Museum, (270) 745-2592. Art Exhibit: The Island of My Love: The Faces and Stories of Cuba. Through April 6. Ivan Wilson Fine Arts Center Gallery. Part of International Year of Cuba. Contact Miwon Choe, (270) 745-7052. Photo Exhibit: Mount Sterling: Gateway to the Heart. Through March 1. Jody Richards Hall Gallery. Contact Tim Broekema, (270) 745-3005. Black History Month Exhibit at Cynthia and George Nichols III Intercultural Student Engagement Center. Through February. Downing Student Union, room 2041. Contact Angie Link, (270) 745-5066. High School Basketball: Girls’ Fourth Region Tournament. Diddle Arena. First-round games at 6 p.m. and 7:45 p.m. Contact Campus and Community Events, (270) 745-2497. 10:30 a.m.: Fix It Fest. Downing Student Union Lobby. Contact Courtney Martin, (270) 745-6827. Noon: Gordon Ford College of Business Career Fair. Downing Student Union, third floor. Contact Career Services, (270) 745-3095. 3 p.m.: WKU Baseball vs. Murray State. Nick Denes Field. Contact Athletic Communications, (270) 745-4298. 7 p.m.: Gender Images Film Series: RBG. Cherry Hall, room 125. Contact Gender & Women’s Studies, (270) 745-6477. 9 a.m.: Kentucky Hemp Industries Association Annual Conference. L.D. Brown Agricultural Exposition Center. Contact Paul Woosley, (270) 745-5967. 3:30 p.m.: Symposium: Solutions for Health Aging: From the Brain to Community Intervention. Downing Student Union, room 2124. Contact Center for Applied Science in Health & Aging, (270) 745-2077. 4 p.m.: Book Club: The Other Side of Paradise: Life in the New Cuba. Beulah Winchel Education Library, Gary Ransdell Hall. Part of International Year of Cuba. Contact Julia Shadoan, (270) 745-2539. 7 p.m.: Hardin Planetarium Show: Starry Tales for a Winter Night. Hardin Planetarium. Contact Planetarium, (270) 745-4044. 7:30 p.m.: WKU Bands Concert. Van Meter Hall. Admission is $5; $3 for WKU students. Contact Music, (270) 745-3751.